Mage Wars is a product of Arcane Wonders, and was created by Bryan Pope. Prilya had spent the last five minutes staring at dragons. Not the sort that pounced on maidens and spat fire—a lucky thing, since she was a maiden—but dragons wrought from polished gold. They stretched across a bas relief decorating the famed dome of Thaddin-ka Cathedral, an edifice that dwarfed the roughhewn tabernacles of her homeland. She smiled. After five dusty weeks on the road, it felt wonderful to be standing in one of most prestigious churches in the land. An honored house of worship in a great, teeming city. The perfect place for her apprenticeship to begin in earnest. “It’s wondrous, is it not?” One of the deacons tasked with greeting the faithful beamed at Prilya. “Is this your first time in Thaddin-ka, Lady Marimet?” He and several other close-shaven young men stood in the vestibule Prilya had traversed a few minutes before. They awaited the throng that would be arriving for afternoon mass. Prilya nodded, but before she could answer, she heard something that gave her pause. A voice, throaty and resonant, just beyond the doors. Truncated monosyllables punctuated with clicks made by snapping the front teeth together. An ignis chant. By the time she cried out, ordering the deacons to flatten themselves against the vestibule floor, it was too late. Ornate double doors splintered, bursting inward, and gouts of roiling red-orange flame engulfed the men. They howled—a wordless, warbling lament—and fell to the floor, writhing like worms on a hook. For the briefest of moments, Prilya she whether she would live long enough to mourn them, and then gasped and stumbled as a blast of searing air nearly knocked her off her feet. Pain, more than she’d ever felt. Scorched skin, blistering, on her face and arms. Her eyes hurt so badly she could barely blink, and singed strands of hair raked her neck. Parishioners shrieked behind her. She glimpsed flurries of activity to both sides, but for a time she could pay attention to little except how much she hurt. She grit her teeth and whispered a prayer to Illinyana-Toh-Vidyas, foremost goddess of the Skyborne, and felt the coil of panic writhing in her gut grow still. Perilya’s first instinct was to run—to flee to the temple’s ruined antechamber—but instead she stooped, unslung her weathered oxskin carryall, and loosed its ties in a rush. Those attacking the temple would be hampered by the flames filling its entrance. She hoped so, anyway. She ought to have time enough to arm herself. If not, she would soon be praying for a quick death. Three men appeared, bulling their way through the splintered, still-burning remnants of the temple door. At first, they were barely visible in the haze surrounding the ruined vestibule, but Prilya could see them well enough to tell their clothing lacked emblem, sigil, or heraldic device. They had come to deal deaths that no one would claim. No lord, or king, or nation, would ever be called to account for the veins these warriors opened, or the widows they made. They were assassins without allegiance or greater purpose, men who struck from the shadows and then faded away, nameless. Gray Men. By the time they emerged from the smoke, coughing through wetted rag masks, Prilya had her etti-ya—a long, narrow rod clad in Ettilene silver—in hand. She held it behind her back, clasped in one hand, fingers curled around the device’s leather grip. The men drew within a half dozen paces of Prilya, their scorched rawhide boots dark with ash. “Entilyet eh-ya yay,” she whispered. “Miyaspih toh.” Forgive me, goddess, for the harm I do in your name. A prayer in a dead language. Words never meant to be formed by a human tongue. The Gray Men hesitated for half a breath, gazing at her wordlessly, and then one stepped forward. The point of his sword arced toward Prilya’s gut. He moved languidly, as if skewering a tasty bit of venison floating in his stew, and the other two barely seemed to have noticed her. Their dead-fish eyes scanned the nave, and she supposed they sought more formidable opponents than a singed, tow-headed girl in soiled travel robes. 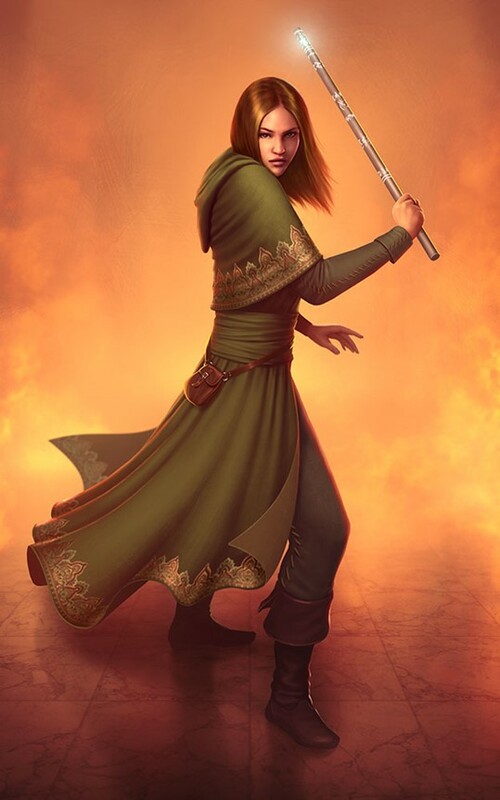 Spinning on the balls of her feet, Prilya let the sword pass to her left, staying close enough to its path for the flat of the weapon’s blade to brush her belly. At the same time, she swung her etti in a tight, sidelong arc that came to a halt when its lip impacted the attacking Gray Man’s face. She ululated as the rod struck home, and the uppermost symbol on the device flared to life. The shock of impact traveled down Prilya’s arm, partially numbing it, and light filled the hall. For an instant, she peered through the clothing and flesh of the interloper she’d struck, gazing at the pale bones beneath. His skull clove in two, with a crack the width of a baby’s finger opening from nose to crest. As the light faded, passing out of the world in less time than it took to blink, her victim crumpled like an abandoned marionette. His body twisted, slumping, between his companions, whose hands had risen to shield their eyes. Prilya slid to one side, rising onto her toes. Thankful she’d braved the disdain of the elder Sisters by dressing in soft doeskin scoe, she executed the tight, energetic spin of a peasant girl dancing—skirts a-flouncing—at her first Festival. Breathe in. Her hip brushed a Gray Man’s grimy vambrace as she rotated past him. And out. As she pirouetted into position behind the assassin, she bent her knees and dropped into a deep crouch, still spinning. In again, and hold, silent. She swung the etti wide, spinning it end-over-end. It gathered speed like a falcon nosing into a deep dive. When she barked a single word of power—a vengeful supplication addressed to a vengeful goddess—an engraving halfway up the rod flashed. At that moment, she drove the etti into the lightly armored flesh behind the Gray Man’s knees. Her target straightened, turning toward her, and for a moment Prilya grew cold, afraid the Goddess had ignored her entreaty. But then his eyes widened. The killer’s legs bent, and then bent some more. He slid to the ground in a contorted heap. The man grunted, struggling to gain his feet. Prilya knew he would never walk again. The last of the interlopers—a hulking fellow with a harelip—peered at each of his fallen comrades in turn. His eyes widened and his jaw worked, and for a moment Prilya wondered if the man might flee. She whispered a quick prayer to the Venna-Ja, the foremost Departed of her order. Each blow Prilya struck diminished her. Better by far that the man should surrender to the temple guard than force her to take him down or perish in the attempt. “Fivven ka-taro,” said the man she had just struck. She recognized the curse, an Ilander tem used to deride women who didn’t know their place. The words spewed from between grit teeth. He scrabbled, still trying to rise, rage and despair contorting pale, close-set features. “Vaun ya ti-fothen. Ya. Finnit-tuh.” His legs wobbled sickeningly, like sticks broken in half and reconnected with soggy strings. Prilya wasn’t sure what the words meant. His violent intent was clear, though. Kill the girl. And hurt her bad while you’re doing it. Harelip’s eyes narrowed and his jaw snapped shut. He turned to face her, holding his weapon—a longsword with a row of cruel serrations halfway between hilt and tip—at the ready. He advanced with the precise, angular steps of a man who was no stranger to the battlefield. Prilya gave ground. If the Gray Man got close enough, he could simply grapple her, snapping her neck or crushing her beneath his weight. She made a quick feint with the etti, breathing an activation that caused it to glow with an enough intensity to convince her attacker she meant business. He took a single long stride, striking so quickly he nearly parted her arm at the wrist, and Prilya hopped back. He’s deadly up close, and almost as dangerous from a stride-and-a-half away. Prilya followed up with another feint, and then another, barking activations that lit this symbol or that. Again, the Gray Man responded, working his way forward with a series of narrow sweeps and overhand jabs. To her eyes, his balance and focus appeared impeccable. A combat instructor’s dream. “It’s almost a shame I have to slay you,” she hissed, meeting the killer’s gaze. Prilya licked her lips, which tasted of cinders and blood. She had the measure her opponent. The big man continued to exhibit perfect technique, but appeared predictable in the extreme. The Ilander practice of honing elite warriors by tasking them with thousands of hours of drills had its drawbacks. Any attack she made would elicit an easily anticipated response. She bent at the knees and grunted, pretending to aim a blow at the man’s thighs, and when he tried to cleave her elbow she straightened, jerking the etti back and up, into the path of his cut. She spat three sounds in rapid succession, “thogh—fen—ouh,” coughing out the last of them at the moment her etti met the Gray Man’s weapon. A triangular etching in the silvery rod’s trunk seemed to leap from the weapon, forming a widening, evanescent projection, and the man’s blade shattered. Shards flew in all directions. Just as Prilya intended, the largest piece—a jagged, glittering awl—drove its way up through her opponent’s gorget. Blood spewed from the wound, forming a frothy inverted fountain that made her want to gag. As the Gray Man staggered in one direction, Prilya lurched in another, gasping. She reached for her side, and her hand came away wet. She allowed herself a pained cry. One of the sword fragments had pierced the flesh between armpit and hip. A reminder from the Goddess, perhaps, that speaking Her words in anger would have consequences. “Or perhaps I just have bat leavings for luck,” Prilya muttered. At least she’d managed to injure herself in a building full of healers. Though it seemed unlikely the wound would prove fatal, the pain in her side was beginning to rival that emanating from her blistering extremities. She gulped, blinking away tears. As Harlip sagged, gurgling his last breath, Prilya took a moment to gaze around the nave. Beams of light descended through broad, rose-tinted windows and then disappeared among streamers of gray-black smoke and ash. Most of the parishioners had fled. She assumed they huddled, praying, in the transept chapels. A few braver souls made their way toward her: a pair of sacramental guardsmen in their distinctive brown woolens; bald, bent-backed Chancellor Benis; and (thanks be to the Holies!) High Priestess Emmera Van Laszis, Prilya’s mistress. The woman’s jaw was set, mouth little more than a pinched pink line, and the fleur de lis atop her golden scepter shone so brightly the onrushing guards were forced to avert their eyes. Prilya sighed, releasing a hot, shuddering breath. Mistress Laszis would set things right, with the injured given care and the guilty punished. And she would make sense of things, somehow, so that Prilya might come to understand how clerics in a great temple—one within the walls of an imperial capital—could be slaughtered beneath the midday sun. The sound of impossibly sharp, heavy footfalls filled the air—sharp impacts more like those of hooves than boots—and Prilya turned toward the burning antechamber. Something was coming, following in the Gray Men’s wake, but she couldn’t make out anything through the smoke. Several heartbeats separated each step, as if whatever had entered the chapel was either very large, moving slowly, or both. Gulping, Prilya took a step back, raising her etti. She tried to ignore the wet warmth flowing across her belly and thigh. Her hand shook, and when she commanded it to cease, it went on shaking anyway. Insubordinate wretch. A figure emerged. While it stood on two legs, and a pair of arms hung from its shoulders, it bore little resemblance to a man. It was thing hewn from the stuff of nightmares. Twelve feet of hoof, scale, and curling, fluted horn. A chest the size of a mountain pony expanded, and when the demon expelled its breath, Prilya choked on the smell of flyblown entrails. The beast took another step, bringing it within a wagon-length of Prilya, and its sickly yellow eyes found her. “It’s me you’ve come for, puss-bag.” Laszis strode into view, scepter held high, a wagon-length to Prilya’s left. The priestess descended the last of the broad stairs separating Narthex from elevated Nave. Prilya shook her head. Lies. The denizens of the underworld were known for that, more than anything. Surely the woman who had plucked Prilya from obscurity, rescuing her from the banal life of a plowshare lordling’s daughter, wouldn’t breach the holy covenants. She waited for her Mistress to repudiate the demon’s accusations. The tall, straight-backed woman stood stock still, mute, and grew red in the face. The light bathing her countenance seemed to dim, if only a little. Guardsmen appeared, gathering in a knot around Prilya’s mistress. As one, they turned to her. From the unsteadiness in the men’s stances, Prilya could tell they were as frightened as she. Nonetheless, their expressions bespoke grim determination. Command us, was the unspoken missive. If we perish at your side, our lives will have been well-lived. Chancellor Benis, who lagged a dozen strides behind, looked equally ready to defend the faith. Shamed by their bravery, Prilya drew a deep breath and lunged at the demon. Words of righteous power gathered on her lips, and holy symbols inscribed on the etti hovered before her mind’s eye. Minith. Litti-atrackan. Moiy. She’d once cracked a limestone boulder with moiy. “I can’t hear you,” Prilya whispered, speaking to no one in particular. “Ears must have been injured in the explosion.” She dove forward, picking up speed despite the waning strength in her legs. The world blurred around her as her feet left the floor. She was dimly aware of her etti taking wing, hurtling through the air like a silvery canyon-eagle. Then she was kissing a marble pillar, which struck her as strange because she had yet to kiss a boy, and why ought she kiss an architectural feature, however nicely formed, before bestowing her affections on a young man? In any event, the pillar didn’t appear to appreciate being kissed, because it broke her nose. Everything spun, and Prilya found herself lying on a wall (how odd!) that tore her shoulder from its socket. A moment later, she came to rest on the floor, which seemed friendlier than the rest of the nave, because it didn’t insist on punishing any of her other parts. Prilya could barely move. She stretched out her arms, resting cracked, bleeding palms on the surrounding floor tiles. They felt cool. Nice floor. Good floor. We’ll be friends always. Prilya felt consciousness begin to depart, slithering from her grasp like one of the clever trout that plied the streams near her parents’ ancestral hold. Her eyelids sagged, and she barely managed to stay alert long enough to watch the battle commence. Laszis drew streamers of shimmering power from the domed Altar of Altheigh, shaping them into bolts that skewered the demon, passing all the way through him and bursting from his scaly back. Gaping wounds bathed the floor in blue-back ichor, but still he stood. Prilya’s eyes closed, and for a time her surroundings took their leave. When they returned, she managed to lift her eyelids just enough to see that guardsmen lay scattered about the hall, backs broken. Her attention turned from them to Laszis, who etched the air with a clatch of runes that—incredibly—drove the demon back, hooves screeching against ancient flagstones. The last thing Prilya would remember of that day were horrid eyeless eels sliding from the demon’s mouth. They tore at her mistress’s limbs even as the High Priestess slew the demon, parting torso from head. She’d managed to drive the flaring crest of her scepter through the creature’s barrel-thick neck. Later on, Prilya would be glad she hadn’t seen her mistress die.